The simple touch of a finger sparks the newest innovation in the quest for quality, responsive patient-centered care. Adapt by Delta Care Rx, an advanced disease management and therapeutics solution, debuts a patient-clinician communication interface powered by TapCloud, a leading provider of real time patient generated health data. Using a provided application, patients with serious, life altering illness will communicate symptoms and experiences directly to their care providers in real time. "Clinicians using the Adapt dashboard will now enjoy unprecedented ability to maximize the benefits of care to the patient while enhancing efficiency and lowering costs," says Drew Mihalyo, founder, president and COO of Delta Care Rx. "The Adapt solution powered by TapCloud supports the 'triple aim' objective to which palliative care providers aspire." Too, the partnership marks the first time that the pharmacist is fully integrated into patient-centered palliative care team conversations, say experts. Now, pharmacists can work side by side with colleagues across the care continuum, ensuring each patient's optimum quality of life. "The entire team is aided by a dramatic increase of patient information available to them," says Mihalyo. In less than one minute per day, patients can access the secure Adapt application from any internet connected digital device, including smart phones and tablets. With a simple touch of a finger, the patient chooses from a range of words selected specifically for his or her diagnosis and medications to report current symptoms or feelings in natural language, not medical terminology. "We offer each person easy access to their professional caregivers, as well as the ability to share information in ways that are clinically relevant and easy to use," says Tom Riley, CEO of TapCloud and the platform's creator. Conversely, clinicians and pharmacists who make up the care team will be able to quickly assess whether a patient feels better or worse, gauge the effectiveness of medication or treatments, check vital signs, or identify the onset of complications. "Previously, the patient and family's ability to recognize, remember, and report key information about what happens between clinical visits has been limited," says Riley. "Now we are able, with the use of one simple tool, to amplify the voice of the patient and bring it to the front and center of care." Clinicians using Adapt by Delta Care Rx will now see the TapCloud dashboards within the secure portal. Visual depictions of the data reported by each patient makes it possible to rapidly interpret key insights, assess well-being, spot developing complications or determine medication side-effects. Established protocols will dictate whether a patient needs to be seen, requires a home health visit, or needs a medication adjustment. As a member of the palliative care team, the Delta Care Rx pharmacist provides 24 hour on-call services seven days per week. Within the scope of the clinical conversation, the pharmacist will be able to make notes for care team nurses and physicians that include medication alternatives, questions, or guidance tailored for each patient. "Bringing pharmacist expertise into the team's discussion offers a significant enhancement to care," Mihalyo says. "With this model, we have the ability to see the total picture of patient care." Delta Care Rx is a leading sponsor for the annual American Association of Hospice and Palliative Medicine, or AAHPM, Conference, March 14-16, 2018 in Boston, Mass. Attendees will network with peers in hospice and palliative care organizations from across the nation, while simultaneously learning from a broad variety of industry experts and thought leaders. Delta Care Rx President and COO Drew Mihalyo, PharmD, will be featured in a Showcase Theater, titled "What Telemedicine Can Do for YOUR Organization," with TapCloud's Tom Riley, CEO, on Friday, March 16. 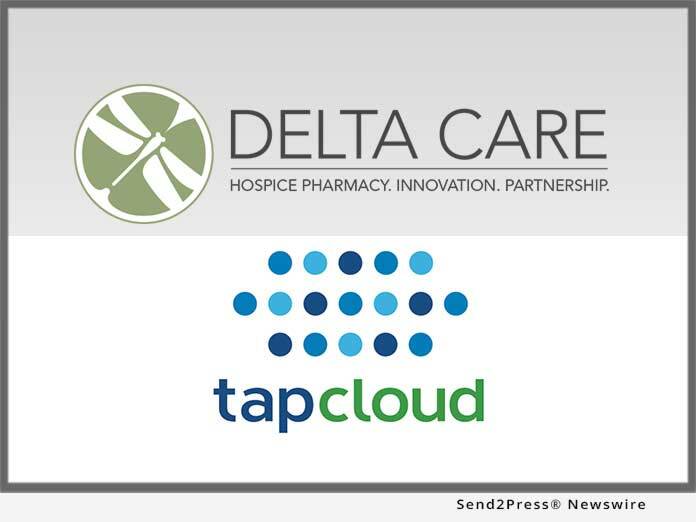 Delta Care Rx partners with telemedicine innovators like TapCloud, to provide its clients with easy to use, innovative interfaces. These include Adapt by Delta Care Rx and powered by TapCloud, as well as HIPAA compliant, secure video conferencing and virtual patient engagement. Delta Care Rx - http://www.deltacarerx.com - transforms and improves the hospice pharmacy industry through business transparency, innovation, extreme customer service, and the maintenance of vital community pharmacy relationships. As a pharmacist owned, privately held provider, Delta Care Rx sets the industry benchmark for pharmacy benefit management, creative prescription mail order, on-demand pharmacist services, and hospice tailored e-Prescribing. Additionally, Delta Care Rx offers electronic tools, including cutting-edge telemedicine technology to improve the quality of palliative patient care during serious illness or at end of life, and simplifies essential workflow/ordering processes within hospice settings. TapCloud - http://www.tapcloud.com/ - allows patients and providers to communicate in ways that improve the doctor-patient relationship, focus clinicians on patients that need the most attention, and ensure that the patients who require services receive those in a timely manner that maximizes health benefits, improves quality of life, and minimizes expenditures of health resources.